Tech Blog with latest tech news CopyShould Best Free File Compression Software for Windows Tech Blog with latest tech news CopyShould!! A file compression software would allow you to compress one or more files into a smaller file to save space and to shorten the time to upload and download the files. Compression tools are very useful and very handy with its modern graphical interfaces and drag and drop capabilities. 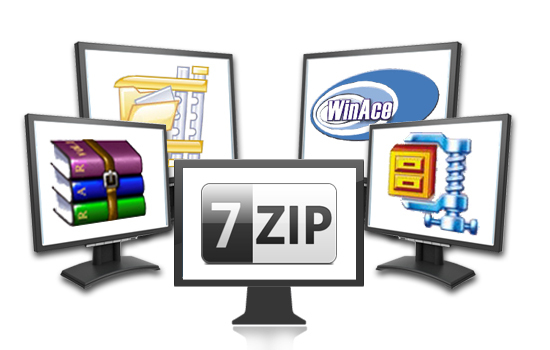 Winzip is one of the most popular compression software. However, it is not free. Hence, we created a list of free Top 5 compression utilities that you can use if paying is not an option for you. 7-Zip is probably the leading free file compression software for Windows with its amazing ability to shrink files on the fly. It has advanced functionalities that include the capacity to produce solid and self-extracting archives as well as to modify password protection and compression level. Albeit it has a minimalistic interface, it is easy to understand and operate. 7-Zip supports 7z, ZIP, CAB, RAR, ARJ, GZIP, BZIP2, Z, TAR, CPIO, RPM, and DEB. For a free software, the performance is close to perfection. IZArc is one of the best file compression software out there which is compatible with a huge number of archive formats such as ISO, 7-zip, black hole, TAR and many others. It can also convert and save to 12 different formats and has a similar interface with WinZip. PeaZip is packed with features that are great for the experts while also giving a user friendly interface to novice users with its drag and drop functions. It has a WYSIWYG (What you see is what you get) platform that is so easy to navigate. Peazip currently provides three types of installer including a portable one. Cons: one type of installer is bundled with open candy, although a plain installer is also available. ZipGenius is another great compression software that provides a lot of functionalities such as being able to add your signature and contact information to any zip file you create. It also offers encryption, antivirus scanner support, download time calculator, disk spanning and a lot more. It also offers a multi functioning plug-in support and is available in several languages. Hamster compression software has a colorful interface with vividly labeled buttons that will make navigating a breeze. It has a clear guide on how to add files by dragging, dropping or browsing. It has a great functionality to right-click a file and choosing the zip options directly from the context menu. Click to viewWhether you've been sent a simple ZIP archive, you need to create and share your own compressed files, or you're staring down the barrel of some obscure archive format you've never seen before, having the right file compression application in your corner is a must. Earlier this week we asked you to share your favorite file compression tool, and over 500 comments later, we're back with the five most popular answers. Read on for a closer look at the five best file compression tools, then get ready to punch the chad for the app you like best. 7-Zip is a free, open-source file archive utility with a spare interface but powerful feature set. With support for most popular compression formats (and quite a few not-so-popular), this lightweight, open source option does the job quickly and without fuss. While some 7-Zip users complain about its spare interface, others are happy with 7-Zip's no-nonsense approach and fast operation. IZArc is the compression tool that may take home the prize for most-supported read and write formats for this Hive Five. IZArc is also the only featured archiver apart from PeaZip that distributes a portable version on their web site (though third parties have made other apps portable—like 7-Zip Portable). Users go for IZArc for its attractive interface and its low pricetag. IZArc is freeware, but donations are accepted. 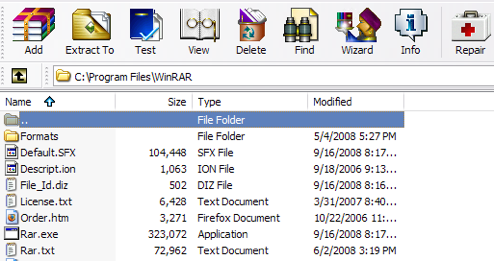 WinRAR is a powerful file compression and decompression tool that's been around since 1993. As the first result in a Google search for RAR, it's probably the first option most of us stumbled onto when we ran into our first RAR file. That said, WinRAR supports a wide range of formats. It's also one of the few archivers capable of writing RAR archives—though overall it's limited to creating only RARs or ZIPs. WinRAR costs a pretty steep $29 for a license, but several users are happy to suffer through the nag screens to avoid the cost. PeaZip is a free and open-source archive manager that supports a boatload of formats. Unlike its open-source sister, 7-Zip, PeaZip also has a very attractive interface, from the main application interface down to the desktop icons it uses when you set it as your default compression tool. Like IZArc, it's also available in a portable version—so even if you don't go with it for your default, it's worth tossing on your thumb drive just in case you need a little compression on the road. The Unarchiver is the built-in default file compression utility for Mac OS X. Unlike Windows, which only supports the ZIP format out-of-the-box, The Unarchiver handles most major formats. The catch: The Unarchiver is a read-only application, so if you're on a Mac and you want to write to more obscure archive types than ZIP, you may need to add an extra tool to your arsenal. Most OS X users, however, are happy to stick with The Unarchiver for all their decompression needs. Now that you've seen the best, it's voting time. This week's honorable mentions go out to jZip and ALZip. Whether or not your app of choice made the short list, let's hear more about it in the comments. video libraries for free and without registration.